Oops! Tint Cheek Cushion #01 Sugar Pink＇Product DescriptionEmulsion-type Tint Cheek Cushion Completes the cheek makeup with a dewy finish.＇How to usePress the tube till the cheek tint emerges on the cushion tip and then softly tap the cushion on your..
Oops! Tint Cheek Cushion #02 Cream Peach＇Product DescriptionEmulsion-type Tint Cheek Cushion Completes the cheek makeup with a dewy finish.＇How to usePress the tube till the cheek tint emerges on the cushion tip and then softly tap the cushion on you..
Petal Blusher #01＇Product DescriptionLong-lasting. Liquid texture: No-creasing. Matte finish. Lovely Vitality Colors. Expresses the clear and lovely floral colors on the cheeks.Moist water texture adheres smoothly on the dry skin.Forms a thin blusher..
Petal Blusher #02＇Product DescriptionLong-lasting. Liquid texture: No-creasing. Matte finish. Lovely Vitality Colors. Expresses the clear and lovely floral colors on the cheeks.Moist water texture adheres smoothly on the dry skin.Forms a thin blusher..
Petal Blusher #03＇Product DescriptionLong-lasting. Liquid texture: No-creasing. Matte finish. Lovely Vitality Colors. Expresses the clear and lovely floral colors on the cheeks.Moist water texture adheres smoothly on the dry skin.Forms a thin blusher..
Petal Blusher #04＇Product DescriptionLong-lasting. Liquid texture: No-creasing. Matte finish. Lovely Vitality Colors. Expresses the clear and lovely floral colors on the cheeks.Moist water texture adheres smoothly on the dry skin.Forms a thin blusher..
Petal Blusher #05＇Product DescriptionLong-lasting. Liquid texture: No-creasing. Matte finish. Lovely Vitality Colors. Expresses the clear and lovely floral colors on the cheeks.Moist water texture adheres smoothly on the dry skin.Forms a thin blusher..
Smart Drawing Blusher #01 Daisy Pink＇Product DescriptionPart of Innisfree's latest Smart Drawing makeup collection, these cream blushers come in paint tubes and with a built-in brush for easier application. The blusher leaves a soft, dewy finish with..
Smart Drawing Blusher #02 Cherry Blossom Pink＇Product DescriptionPart of Innisfree's latest Smart Drawing makeup collection, these cream blushers come in paint tubes and with a built-in brush for easier application. 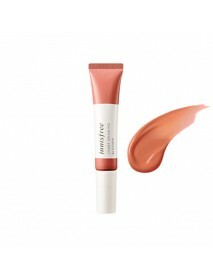 The blusher leaves a soft, dewy fi..
Smart Drawing Blusher #03 Peach Coral＇Product DescriptionPart of Innisfree's latest Smart Drawing makeup collection, these cream blushers come in paint tubes and with a built-in brush for easier application. The blusher leaves a soft, dewy finish wit..
Smart Drawing Blusher #04 Dry Rose Bouquet＇Product DescriptionPart of Innisfree's latest Smart Drawing makeup collection, these cream blushers come in paint tubes and with a built-in brush for easier application. The blusher leaves a soft, dewy finis..
Smart Drawing Blusher #05 Shy Camellia Flower＇Product DescriptionPart of Innisfree's latest Smart Drawing makeup collection, these cream blushers come in paint tubes and with a built-in brush for easier application. The blusher leaves a soft, dewy fi..